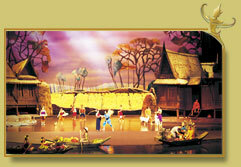 Trip Description: Siam, the Kingdom whose history customs an civilization have transcended time. The land of beauty and cultural treasures that have descended down through centuries. 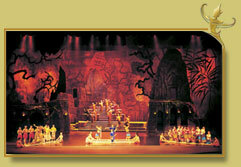 Rejoice the glory of ancient Siam and be fascinated by the wonder and grandeur of ....Siam Niramit. Meet our staff in the hotel's lobby. Then transfer to Siam Niramit. The grand procession of Lanna Kingdom in the North.The colourful livelihood at the Southern peninsular where overseas traders blended in with the locals. The ancient empire of Khmer where the cheerful Northeastern folks blend song and dance into the work of their daily life. The Kingdom of Ayutthaya, a the heart of the fertile land of Chao Phaya basin, that built farmers of all kinds and brave men of all times. Despite the diverse cultures and livelihood, Thai people are all bound by common belief in religious principle of the Law of Karma. The good deeds or bad deeds in this world will result in merit or suffering in the next life. Hell, depicts the souls whose former lives were indulged in greed, anger, and lust. Himapaan Forest, the boundary between human world and heaven, where mythical creatures exist. Believing that to go to Heaven, one must gather merit in their present life. In this final act Siam Niramit will take you to enjoy all year round of merit making festivals, which combine religious ceremony with colourful and joyful celebration.